Schedules are showing the External Tank camera – which will ride with Atlantis’ ET-138 – is to be modified – allowing it to beam back video of the tank’s disintegration after parting ways with the orbiter at MECO (Main Engine Cut Off). Meanwhile, STS-135’s pad flow now includes the replacement of the left outboard Window Contamination Control (WCCS) desiccant tubing. Although Atlantis has kicked up a couple of protests via a number of Interim Problem Reports (IPRs), none are classed as any concern for the launch date, or indeed the schedule of the Tanking Test – set to take place in the middle of this month. Indeed, the pad flow has transitioned from S0009 Launch Pad Validation to S0024 Pre-launch propellant servicing tasks with all minor issues resolved, either at the pad, or via managerial decisions. Items of interest center around IPR-39 to 44 – mainly relating to the loading of hypergolic fuel into the Solid Rocket Boosters (SRBs) Hydraulic Power Units (HPUs), which will be used to drive the Thrust Vector Control (TVC) system, allowing the nozzles on the boosters to aid the steering of the stack during first stage ascent. “New IPR 135V-0042 was picked up by HPU during left SRB TVC rock system fill. The handle and stem of a GN2 regulator valve on the left SRB servicing cart came loose. Repair was completed and IPR will be upgraded to GSE (Ground Support Equipment) PR (Problem Report),” noted the NASA Test Director (NTD) processing reports (L2). 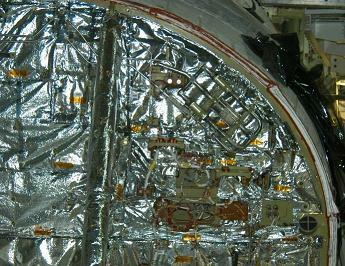 Completed tasks in the flow include the Payload Bay Door torque tube installation, SSME (Space Shuttle Main Engines) and Aerosurface FRTs (Flight Readiness Tests). GO2/GH2 blank off plate installation in support of the Helium Signature Test (set for Saturday), S1287 Orbiter AFT closeouts and S0037 tanking test preparations. 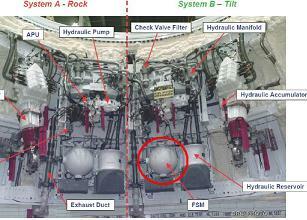 Next week will involve the hypergolic loading of Atlantis’ Reaction Control System (RCS). Propellant loading of the orbiter’s Auxiliary Power Units (APUs), which will provide hydraulic power to numerous systems, such as the Flight Control Surfaces (FCS) and SSME gimbals, is already in work as of Wednesday. “S0024 Pre-Launch Propellant Servicing preps continue. FRCS (Forward Reaction Control System) QD (Quick Disconnect) mates/leak checks in work. APS and APU QD mates/leak checks are scheduled over the weekend. Hyper Load is scheduled to begin early Monday morning with CTS (Call To Stations) at 0400 EDT,” added the NTD. Unrelated to the water intrusion observed – and cleaned up – on Atlantis after the storm, another potential “moisture issue” remains under investigation at an ERB level. The observation was made during the Window Contamination Control (WCCS) desiccant borescope inspection task, with indications are that moisture had intruded from an unknown source. The WCCS is simple venting system which utilizes a pair of desiccant assemblies as part of its operation, plumbed into the windows through stainless steel tubing. During each Orbiter Processing Facility (OPF) flow, the assemblies are purged with nitrogen, while the beads in the desiccant cartridges are checked. Every two to three flows, the desiccant cartridges are serviced with new desiccant material. It is surprising that moisture could have made its way into the system, given the highly controlled environment inside the OPFs during servicing, so while the ERB review the status of the system, a plan has already been approved to replace the left hand outboard WCCS desiccant, with a desire to have the work completed ahead of the Tanking Test. The External Tanks fly with a Sony XC-999 video camera, mounted inside the tank’s liquid oxygen (LOX) feedline fairing – a metal covering that protects the area where the fuel feedline penetrates the inter-tank – with the camera pointing down the tank. 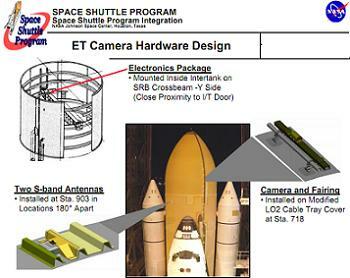 The camera debuted for a one-off ride during STS-112’s launch, although this was implemented mainly for the purpose of PAO coverage, and was located higher on the tank – near the top of the intertank – prior to its full time integration with the tanks from STS-114 onwards, as part of the Return To Flight (RTF) requirements. The 3.5 mm lens camera provides a field of view of about 100 degrees, offering a look at the vicinity of the tank’s bipod attachment area, a portion of the External Tank where the liquid hydrogen tank and intertank ﬂange area are adjoined, and a portion of the bottom side of the Orbiter. The camera has proved its worth over the years, capturing both amazing ascent footage – which is now a regular feature of the live NASA TV launch coverage – whilst carrying out its primary task of observing Thermal Protection System (TPS) foam liberations from the tank, capturing vital information on both the timing of any events, along with any resulting impacts on the orbiter. 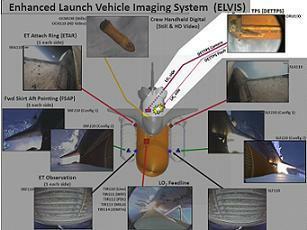 The implementation of the camera was part of the build up of the Enhanced Launch Vehicle Imaging System (ELVIS), which includes cameras on the SRBs, the ET Umbilical Well of the orbiter, and most recently the ascent cameras placed on the orbiter’s “dashboard” which capture LO2 Ice Frost Ramp (IFR) foam liberations. “The ET LO2 feedline fairing camera is powered and controlled automatically from the electronics package mounted on a support beam located between the LO2 and LH2 tanks,” noted the specific section on the system in the 1500 page INCO systems handbook (L2). The camera’s battery pack includes 20 nickel-metal hydride batteries, which provides approximately 28 volts DC. Though the batteries will last for about 70 minutes – mainly to allow three launch attempts prior to the need to recharge/replace the batteries – the picture is usually lost not long after ET/Orbiter separation. The camera has two ‘blade’ S-Band antennas – with a frequency range between 1.55 to 3.9 gigahertz, most often used for telemetry downlink. 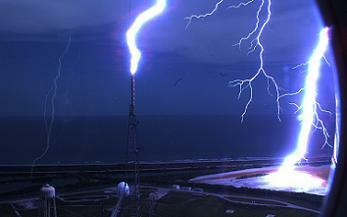 Each is about 2.5 inches long, and will transmit a 10 watt signal to the ground stations. The antennas are located on the opposite side of the tank from the Orbiter about 45 degrees from the tank center line. The complete camera system, weighing 32 pounds, activates approximately three minutes prior to launch and operates for about 15 minutes following liftoff. The video is downlinked from the tank during flight to several different NASA data receiving sites, and then relayed for broadcast on NASA TV. The last of these receiving ground stations is the Wallops Flight Facility, located on the ascent path, on the Virginia Eastern Shore. Riding with the final ET on the final Shuttle mission, the camera is hoped to provide a star role during both Atlantis’ ascent and ET-138’s demise, after engineers noted a modification on the flow schedule (L2 information). The modification will involve the rewiring of the camera’s battery pack – believed to be specific to the G-Switch timer activation – allowing it to film from lift off, through ascent to MECO, but then allowed to continue operating through until the ET breaks up – depending on how long the camera survives as the tank re-enters. “The camera system provides the capability to RF downlink the ET camera video signal to ground stations from RF activation until G-switch timer activation at MET 15 minutes, which effectively turns off the transmitter (a G-switch is a mechanical device that senses acceleration in order to close its contacts),” the INCO handbook explains. Now, per schedule, a small team from the Michoud Assembly Facility (MAF) will carry out the modification during NDE (Non Destructive Evaluation) testing after the tanking test. The mod is in the flow for June 25. 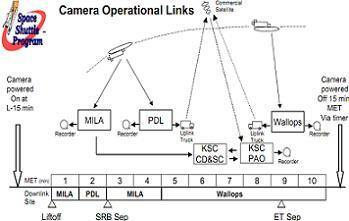 However, no notes – at this time – have confirmed how the footage will be beamed back, given the ground station set up loses the ability for the camera to transmit to Wallops after MECO due to LOS (Loss Of Signal). It is likely a P3 Orion aircraft – or a ship in the required vicinity – will be utilized. 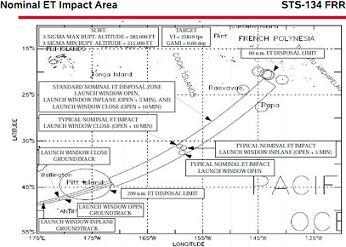 The video signal – which is frequency modulated on a 2272.5 MHz carrier and downlinked to ground stations – would need to be picked up as far as in an area near the Cook Islands, which is the disposal area for the tank after it re-enters. As is usual, most of the tank is destroyed during entry, with only the chance of a few smaller pieces – such as attach points and aft orbiter connections – managing to make it down to the ocean surface. Previously, only footage a few minutes after MECO has been seen – via handheld video taken by the orbiter’s crew on the flight deck. A video was also taken during STS-29, when ET-36’s re-entry over Indian Ocean was viewed by a US Navy Aircraft. 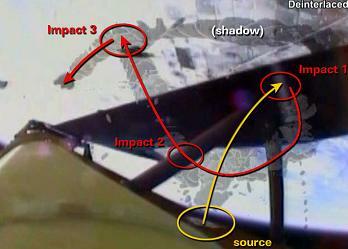 The prospect of footage from the tank itself – as it vents and starts to disintegrate – on the final ever shuttle mission, may not be up to the high standards of the Soyuz “Flyabout” footage of Endeavour and the ISS, but it would provide a potentially stunning viewpoint of the final Shuttle ET, prior to its demise.